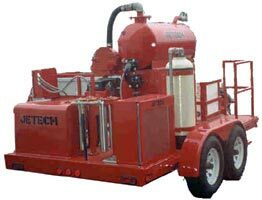 JETECH’s water recovery systems provide a solution for the removal of gray water from your water jetting projects. Our systems recover, clean and recycle the dirty water left over from surface preparation and cleaning for safe disposal or reuse. Reusing waters promotes efficiency. Water recovery collects any water that may run off into the surrounding area, so using JETECH recovery solutions are good for the environment. Using a water recovery system may be necessary, as they are mandated by environmental regulations in the area where you are performing high pressure water jetting. Our systems meet most municipal and environmental regulations. Also, your customers will appreciate the cleanliness, safety, and attention to the environment water recovery entails.